The Santoemma CARPET program includes the widest range of machines and accessories for professional carpet cleaning, developed to solve cleaning problems in any size area. The whole range is characterized by reliability and robustness. Extremely reduced drying time: the carpet can be dry in 1 hour! The Santoemma Method incorporates all the cleaning factors within carpet cleaning and uses them simultaneously and optimally: chemical action, mechanical action, temperature, time and vacuuming. Each factor has been optimized by the design of Santoemma special systems and devices that are added to a basic injection-extraction machine, transforming it into a “Professional SET” for carpet cleaning. 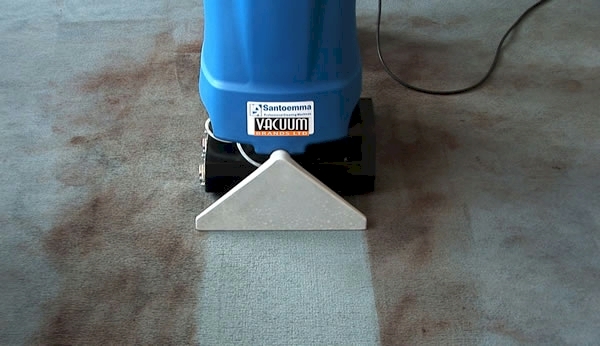 The drying time of the carpet after cleaning greatly depends on the vacuum strength. A specially designed high waterlift vacuum system has been developed for Santoemma machines, which allows them to get up to 50% higher waterlift than standard carpet extractors. It is possible to recover up to 95% of the sprayed solution. This results in an extremely shorter drying time than with normal carpet extractors. Not only is the drying time reduced, but also a better cleaning result is obtained. This is due to the extra solution extracted from the carpet fibres, containing extra dirt that was in the carpet. The same residual dirty solution, if left evaporating in the carpet as it usually happens, would leave the carpet not so clean as with Santoemma machines. The cleaning result is improved with the mechanical action of a rotating cylindrical brush. This allows complete cleaning of each fibre by removing dirt from the base of the carpet fibres, which otherwise resurfaces a few days after cleaning. The mechanical action of the brush is therefore essential to obtain a professional result. In carpet and textiles cleaning, the cleaning result can be improved by using a hot solution, instead of room temperature solution. Specific tests show that cleaning carpet with just 10°C more can give the same result as cleaning twice. The Santoemma instant heating system provides hot water immediately after switching the machine on. It is not necessary to wait a long time until the whole solution tank gets warm, as it happens with other hot water machines on the market. A pre-spray of a concentrated chemical solution is usually recommended before starting cleaning. The extended contact time of the chemical assists the removal of dirt from the fibres, therefore achieving better cleaning results and reducing the time spent on the subsequent cleaning operations. Sometimes the pre-spray is done using manual or electrical pre-treatment devices, which are separate and extra machines. Santoemma has developed the SMARTKIT, a patented device that allows the pre-spray process to be done by the same machine used to clean. During the pre-spray process, the sprayed solution is very concentrated. This provides the appropriate quantity of chemical, without overwetting the carpet. Thanks to the machine pump’s high performance, the operator can pre-spray surfaces very fast. Because the operator can use the complete solution tank for the pre-spray, a greater area can be sprayed and time saved by not filling up separate portable pre-spray devices. The solution of water and chemical is usually obtained by directly adding chemical into the solution tank. To get the correct concentration, it is necessary to calculate the quantity of chemical to be added, according to the solution tank capacity. After cleaning, the residual solution in the tank is normally wasted. The SMARTKIT system allows the chemical to be automatically mixed during the cleaning process. This always provides the correct mixture without wasting any chemical. After cleaning a carpet with chemical, it is recommended to rinse it afterwards. This is in order to remove any sticky residue that is left, which causes the carpet to re-soil quickly. The rinsing phase, though important, is only seldom performed because of the time it requires: it would be necessary to drain the complete tank and fill it with clean water only. For Santoemma models equipped with the SMARTKIT system, it is possible to rinse the carpet by simply turning a lever. Therefore no chemical is wasted and time is saved. Rinsing the carpet at the end of the cleaning process will make it re-soil as slowly as if it was new. The average dirt level (A.D.L.) of the carpet is much lower between one cleaning and the next. Santoemma machines are able to work both in maintenance and restorative deep cleaning modes. This is set according to the quantity of dirt to remove and the lapse of time from the previous cleaning. For a restorative deep cleaning, a water jet, sufficient to completely clean even a very dirty carpet, is sprayed. For maintenance cleaning a reduced quantity of water is sprayed. With the combined use of mechanical action, high temperature and extended chemical action the cleaning effectiveness improves considerably. Therefore a strip of carpet can be cleaned with a single pass, rather than with many passes as it happens with the traditional injection-extraction system. As a result, water usage is decreased by up to 75% compared to the basic injection-extraction system. Moreover the high waterlift vacuum system allows recovering a higher percentage of water than traditional injection-extraction machines (about 90% against 80%). After cleaning, the residual solution in the carpet fibres is therefore greatly reduced and the drying time is extremely shortened: the carpet can be dry in 1 hour! Using the Santoemma method, the time it takes to clean 1 square metre is reduced by up to 67% and much less effort is required from the operator. The use of water and chemical can also be reduced by up to 80%. All these features coincide with the growing demand of the cleaning sector to be responsible in the use of resources involved in the cleaning process. Box extractors are composed by machine body, hoses and external wand used to spray and vacuum carpet. An optional Power brush wand can be used instead of the normal wand. By adding special optionals, a Santoemma box extractor can be transformed in a Professional carpet cleaning set, which combines all the cleaning factors in an optimal way, giving incomparable cleaning results. Self contained machines incorporate the cleaning unit below the machine body. The operator moves the machine on the carpet surface, cleaning parallel stripes of carpet, with higher performances in terms of square meters cleaned per hour. External tools can be used as well, to clean hard-to-reach areas.